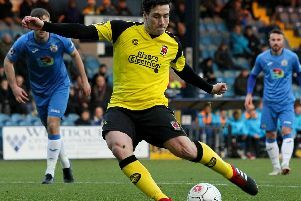 Chorley face another week with their feet up, but boss Matt Jansen says that his men need to be ready for a hectic two months. Jansen’s side have not played since they drew 1-1 with Nuneaton on February 24, and now they face another weekend without league action. But when they do get back at it, against fellow play-off chaser Spennymoor Town on March 20, it will be the start of a six-week 11-game run-in, with the Magpies also facing a LFA Challenge Trophy semi-final clash against Lancaster, before they host Alfreton on the final day of the season on April 28. Jansen hopes they can emulate their September and October form and go on a similar run that saw them lose just once in 11 games to fuel a promotion push: “This will either make or break our season. “Thankfully, we haven’t dropped down the league table and currently sit in ninth position – three points off Spennymoor in the final play-off place. “It is important we remain focused in the run-in over the next six weeks, particularly when we play the midweek matches we’ve got coming up. “I want to recreate that spirit and character we showed in September and October, when we went on a fantastic run. “We lost only once in 11 matches, winning nine of those, most notably the 4-3 victory at Boston United in the FA Cup fourth qualifying round replay, which set up that special match against Fleetwood Town in the first round proper.